No two grooms are created equal, and JustMensRings.com strives to deliver high-quality rings that are as unique as the men hoping to wear them. If you are in search of a one-of-a-kind wedding band to symbolize the commitment of a lifetime, look no further. 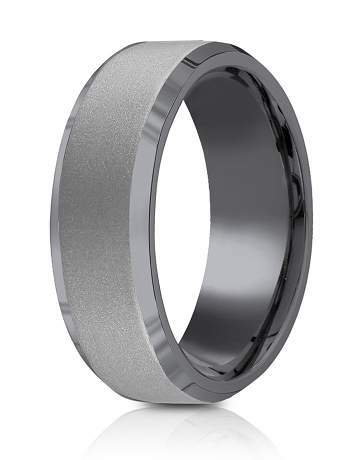 Our tantalum 7mm powder-coated finish high polish beveled edge design ring is the perfect alternative wedding ring to accentuate your personality. This fashion ring features a clean powder-coated satin finish center framed by glazed beveled edges for a sleek and sophisticated appeal. Tantalum has been used in popular metal alloys for decades, but it has become one of the most beloved alternative metals for wedding bands. This rare earth metal is slightly darker in color than platinum but it features the same strength at a fraction of the cost. Finding your forever ring can be challenging. Luckily, you have come to the right place. Our tantalum 7mm powder-coated finish high polish beveled edge design ring is the perfect accessory for unbridled style whether you are headed to the office, the gym, the beach, or anywhere your adventures may lead. This timeless wedding ring is eligible for engraving services, so you can personalize a custom message to capture the excitement of your big day. We offer a wide selection of wedding bands made of alternative metals. Need help finding the ring of your dreams? Please contact a member of our team so we may better assist you.